Charles Boyd was born December 22, 1919, in Chula, Missouri to Margaret and Shelby Boyd. Charles bravely served during World War II in the United States Navy in the Pacific and was always very proud of that fact. He entered the Navy on January 14, 1941 and served until November 28, 1946. He was married to his first wife, Mildred Hughes, and they had four daughters together. They made their home in Olathe Kansas. He was a tireless and innovative businessman in Olathe and was always “a little ahead of his time.” He owned and operated numerous retail stores including grocery stores, discount stores, and most recently Olathe Lanes East Bowling Center. He was also a member of the First Baptist Church of Olathe. He served on the local school board and participated in several civic organizations. 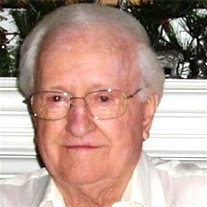 Charles was a genuine example of the “greatest generation” displaying a diligent work ethic. He had one of the quickest minds, coupled together with creative humor and endless wit. Charles was preceded in death by his parents, his second wife, Joan, his brothers, Raymond Boyd, LeRoy Boyd, and Leland Boyd, his sister, Shirley Dowell, and one daughter, Coleen Carter, and one great grandson, Simon Balentine. Charles is survived by his daughter, Cynthia Crumley, married to Keith; daughter, Melody Balentine, married to Joe; daughter, Merrie Rucker, married to Vinse. Charles is also survived by his nine grandchildren, Justin, Kelly, Anna, Matthew, Adam, Morgan, Burton, Cameron, and Audrie; and he is survived by three great grandchildren, Skyla, Teddy, and Peter. Visitation for Charles will be held on Thursday, February 23, 2017 from 9:30am to 11am at Memorial Events of Johnson County, Chapel & Memorial Gardens 11200 Metcalf Ave. Overland Park, KS 66210. Funeral Services will be at 11am in the chapel. Burial and Military honors will follow in Oaklawn Cemetery, 13901 Blackbob Road, Olathe, KS 66062. Memorial Contributions may be made in Charles name to Olathe Health Charitable Foundation, 20375 West 151st St., Suite 363 Olathe, KS 66061. For more information or to send condolences to the Boyd family visit www.memorialeventsjc.com.